Even the best, most disciplined writers burn out on their writing routines. If you feel like you’re going through the motions, it might be time to reassess your habits. Here are ten simple changes that will transform a good routine into an excellent one. Do you always write for a particular genre or audience? Why not switch up your routine? Ian Fleming achieved outstanding success with his James Bond novels, but he later wrote another winner, the illustrated children’s story Chitty-Chitty-Bang-Bang: The Magical Car, for his son Caspar. 2 Write when you’re at your best. Are you an early bird or a night owl? If you’re more productive at a certain time of day, reorganize your schedule to get work done when you’re most effective. You might also find that you work best on different types of projects at different times of the day. For instance, some people like to do creative writing in the morning and reserve technical tasks for after lunch. You don’t always have to write at a desk. A change of venue might be just what you need. Write somewhere that makes you happy or a place that inspires you. Don’t forget to bring everything you need to work (fully-charged laptop, lunch, research materials, etc.). Work isn’t a marathon. To prevent mental fatigue, take a break from intense work sessions. Try short, intense bursts of activity followed by periods of rest. According to , breaks allow your prefrontal cortex (the part of your brain involved in logical thinking and willpower) to get the rest it needs to function properly. Choose a refreshing activity for your pause, such as taking a walk or eating a healthy snack. 5 Swap junk food for brain food. Speaking of snacks, try some healthy ones. Writing snacks are essential for writers. It’s important to refuel your body whenever you’re trying to craft the perfect piece. Nuts are one of the perfect snack options for writers. They are high-protein fuel for your brain that will keep you full and engaged throughout your writing experience. Walnuts, in particular, are a great option. They’re a great source of omega-3 fatty acids, which supports brain and nervous system function. Productivity is not the only focus of a good writer. Like a pitcher of water, you will eventually go dry if you never replenish your resources. So, incorporate reading time into your schedule. Besides reading for relaxation, choose a piece of literature to study. Examine how the author uses grammar, sentence structure, and literary devices and imitate his or her best practices. 7 Improve your work-play balance. If writing is your career (or your dream job), you likely spend a lot of time and effort perfecting your craft. However, you may be missing opportunities for creativity and growth. And writing as a hobby can encourage creativity but decrease the likelihood of you finishing what you start. Aim for a healthy balance. Pursue opportunities to learn and grow while challenging yourself to stick to deadlines and accomplish concrete goals. We believe in empowering everyone to communicate clearly, effectively, and confidently. We’re just getting started. Writing doesn’t have to be a solo activity. Colleagues, family, and friends can encourage and inspire you. For example, why not ask for some constructive criticism on a work in progress or brainstorm ideas in a group session? Evidence found by IZA Institute of Labor Economics suggests that can lead to “knowledge spillover.” Simply put, you can benefit from the knowledge and expertise of others if you take the time to communicate with them. 9 Change the reason you write. James Patterson, the author of the Women’s Murder Club book series, donated over one million of his books to schools and youth programs because he wanted to help kids “become passionate readers.” Find an opportunity to use your skill to help others by searching for volunteer writing jobs on an employment search engine. Once you’ve set a schedule to write, eliminate as many interruptions as possible. External distractions (e.g., your dog scratching the door to go out, a ringing telephone, a breeze blowing your papers off your desk) and internal distractions (e.g., hunger pains or a worry about something else you need to do) can take precious time away from your writing. Necessary distractions, such as eating and walking the dog, can be built into your schedule as breaks. For the rest, find an effective method to deal with them. You can turn your phone on silent during working hours, for instance, and keep a notepad by your desk to jot down concerns. Is there room for improvement in your writing routine? 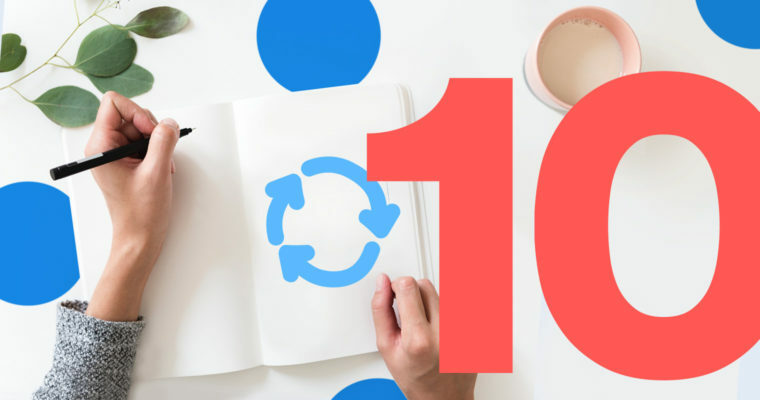 Why not work on these ten simple changes one by one?